Rega launches 2017 Record Store Day turntable | What Hi-Fi? The deck is based heavily on the Award-winning RP3 and features the same plinth, running gear and 12mm glass platter. 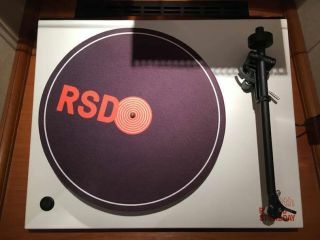 They've been combined with the tonearm from the Planar 1, and you even get a custom RSD mat to lay your vinyl on. The deck will be limited to just 500 units, with around 50 set aside to be signed by a number of big-name bands and artists. These turntables will be shipped out at random, so you'll have a one-in-ten chance of bagging one if you place an order. Rega's 2017 Record Store Day turntable will cost £250 when it goes on sale on Record Store Day itself.